Look at all those zeros. So pretty all lined up. An arbitrary number, yet I liked seeing the bike computer’s odometer turn to 3000. 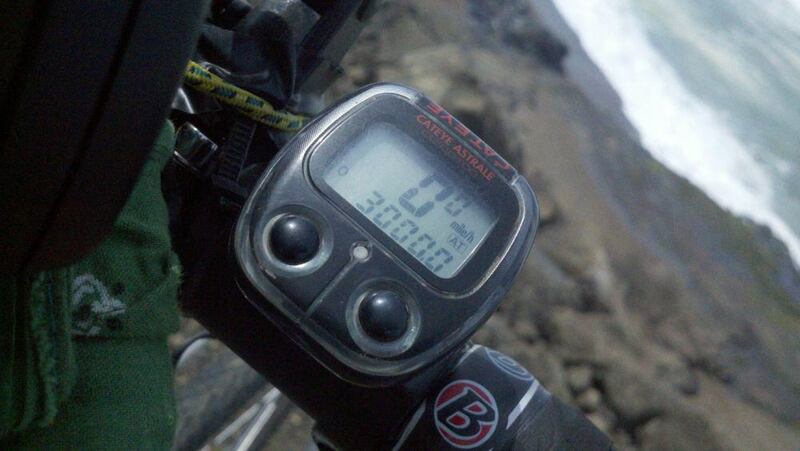 Miles clocked since I started riding again in July 2010. Like a car odomenter turning, mileage numbers seem to carry a significance. But they mean something different on the bike: on a car, we marvel when the 1991 Toyota turns 300,000, saying “Wow, isn’t it amazing how long this car has lasted.” knowing that every mile driven brings the car closer to its end. On the bike, every mile clocked makes me stronger, more alive, actually takes me further away from my eventual end. Granted if I rode 30 miles per ride, this only represents 100 rides. Obviously the number could be higher. This year, the number will be higher, as I step up my training and start doing longer rides. For instance, today I rode 51 miles, from Yachats to Newport and back. The ride up was slow, into a 15mph headwind the whole way. But the return, it was glorious, like sailing! Rocking a tailwind. While I took 2-1/2 hours to ride north, the return was under 2 hours. Like riding uphill for 25 miles, then turning around a cruising downhill for the same. A joy, with no comparison. Each of my 3000 miles was won by hard work, the journey won by pedaling for hours upon hours. Insights abound for me as I cycle. My body gets hard and strong, all the excess burned off. This is so good. So good. ← Do what you love. What are you waiting for?